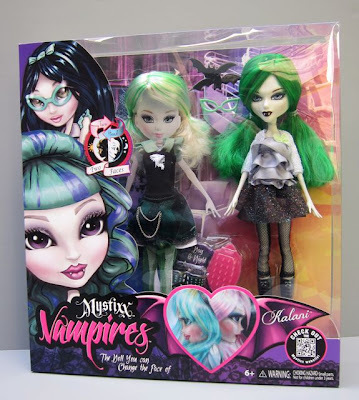 Bratzillaz Update: Midnight Beach "Meygana Broomstix"
Scaris Monster High "Jinafire Long." My City Girls review was very recent, so this is a bit repetitive, but I have had some requests to look at other items in this line, and honestly, I was pretty excited to de-box more of these bright-eyed newcomers. To recap my initial impressions, I was mildly disappointed with Astor because of some articulation issues and mismatched vinyl, and also because of her slightly vacant expression. I was a bit more impressed with Houston's overall look, although she shares all of the above mentioned flaws. Overall, though, I felt pretty satisfied with the high quality clothes, the high level of articulation and the high potential in this line. "Taxi!" Billy City Girl doll by Tonner Toys. Tangkou Update: "The Chinese Girl"
At the end of some of my reviews, I find myself wondering how my opinion might have been different if I had chosen to review a different doll from the same line. Over the next week, I plan to do a series of quick "update" reviews. In these posts, I'll look at dolls that are very similar to ones I have already reviewed, just to see if my initial impressions hold. It's a good time for requests, by the way, so feel free to make suggestions in the comments if there's a doll you'd like to see up close. I already have a few requests to look at Billy and Brook-Lynn from Tonner's City Girl line, so I'll be sure to do that. I am going to start by looking at another Tangkou doll. If you remember my review of Loli, I ended up feeling that she wasn't quite worth her price ($75) and I was left wishing that I'd purchased one of the less expensive dolls. I love the idea of an affordable Pullip-style doll, and wanted to give Tangkou another chance to deliver. I chose The Chinese girl, who cost me $34.99 on eBay (plus $19 shipping). "The Chinese Girl" by Tangkou. Of all the beautiful dolls being released this season, I have been most excited to see the new Tonner Toys City Girl line. Ever since their unveiling at the 2012 Toy Fair, I have been checking the Tonner blog like an addict, waiting for the release day. To give you a little background, Tonner Toys is Robert Tonner's play doll label and Robert Tonner (for those just tuning in) is the designer of my favorite doll of all time. So far, Tonner Toys has produced the cartoonish Little MissMatched dolls with their contagiously happy faces and colorful mix-and-match outfits. The City Girls are a line of more realistic-looking ~16" fashion dolls designed and priced for "beginner" collectors. So, basically they're the younger, more durable cousins of my Cinderella dolls...selling for about half the price. That's more than enough to get my attention. I think there's a hole in the play doll market that is begging for a release like this. We have a wide variety of $20 fashion dolls to choose from (Barbie, Monster High, Bratz, Disney Store princesses), and you can find plenty of collectable fashion dolls for $100 and over (Tonner, Pullip, Integrity, Sybarite, Momoko, etc), but the intermediate market is sparse. As the holidays approach, what do you get for that careful young doll collector who is ready for something special? Or what do you get for yourself when the budget is tight and a regular Tonner doll is out of reach? Maybe these dolls are the answer. On November 9th, the long-awaited email hit my inbox, telling me that not only were the dolls in stock, it was a Free Shipping Friday! Twist my arm, Mr. Tonner. City Girls "Houston" and "Astor" by Tonner Toys. When I started to be interested in Pullip and Blythe dolls a few years ago, I noticed the name "Momoko" popping up in the chat forums and blogs I was frequenting. I have admired pictures of Momoko dolls ever since this first introduction, but have always stopped just shy of buying one because of their high prices. During my recent Tangkou review, Momoko's name cropped up again, and this time I decided that it was time to learn more. 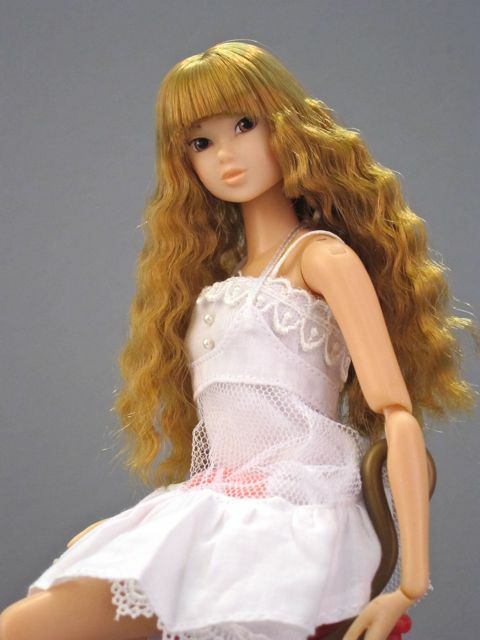 Momoko is a line of highly articulated 10.5 inch plastic fashion dolls made in Japan. 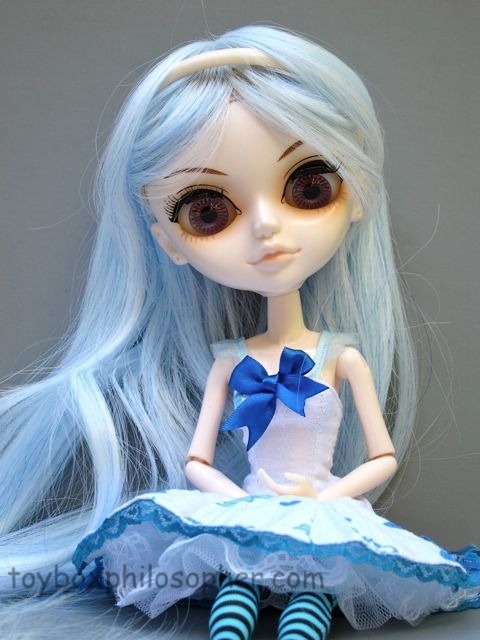 The dolls have childlike anime-style faces and wear very detailed outfits in a wide range of styles. There have been Momoko dolls dressed in wedding gowns, gothic robes, office wear and even a cheerleader uniform. 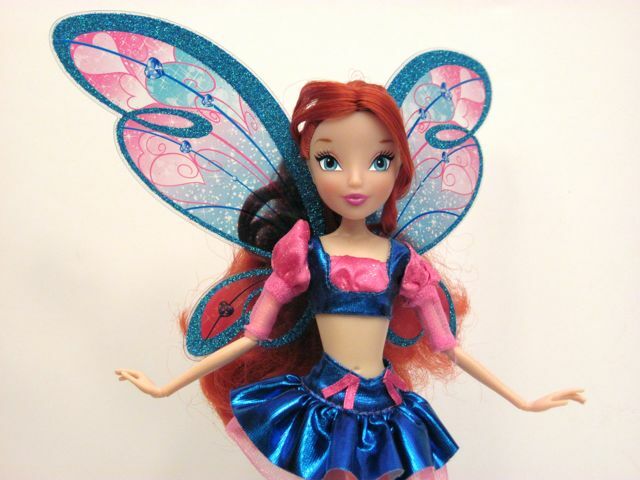 Momoko dolls were first produced in 2001 by the small software company, PetWORKS. The first dolls to be made were called DHEXs and DHEXl. The cryptic acronyms come from "Doll Head EXhibition," the event that hosted the debut of this line. The "s" and "l" after the acronym stand for "short" and "long" haired versions of this first doll. I am grateful to the barbigirl website for providing this information and for having lots of wonderful reference pictures. In 2004, the production of Momoko dolls was passed to the Sekiguchi doll making company, which is where the dolls are made today. Sekiguchi also makes the Monchhichi monkey dolls that first appeared back in the 70s (licensed by Mattel in the US). Do you remember those Monchhichi commercials? They're still stuck in my head thirtysomething years later. Mystixx are a new brand of vampire doll from Playhut. When I think of Playhut, I think of the awesome pop-up structures that my kids used to play in when they were younger. Apparently, Playhut has decided to throw their hat into the increasingly popular ring of slightly creepy but highly fashionable vampire/monster/witch dolls. As I mentioned in my Cutie Pops review, I enjoy seeing a smaller toy company step up and compete with the big guns. It gives me hope for something truly innovative. For example, while the Cuite Pops bear a certain resemblance to Lalaloopsy dolls and some of the other big-headed dolls on the market, they offer something fun and different with their removable eyes and hair. 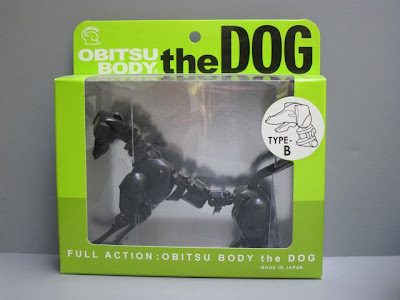 Encouraged by the success of Jada Toys and their Cuties, I wondered if perhaps Playhut had found a fun and unique way to contribute to the monster doll market. Tangkou dolls are highly articulated plastic ball jointed dolls with large heads and color-changing eyes. These dolls are designed and produced in China by the 6th Sense Tang Doll Group. Tangkou dolls have body and head proportions that are very similar to the Pullip line and an eye mechanism that rotates through different eye colors just like the Blythe dolls. 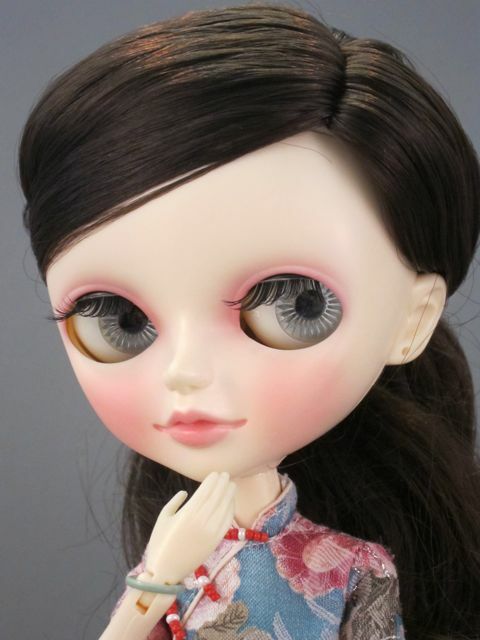 Tangkou dolls cost from $45-$75, which is half if not a third of what most Blythe and Pullip dolls will set you back. I first saw a Tangkou doll just over a year ago on one of my favorite Flickr sites. At that time, it seemed a bit difficult to order these dolls in the US. Now, the ordering process is very easy--from a variety of different countries. You can buy the dolls directly from the Tangkou website (they accept PayPal) and you can often find a nice variety of these dolls on eBay. I ordered my doll back in May from the Tangkou shop and she arrived last week, so, if you decide to order from the website, brace yourself for a long wait. I must have run into some especially bad luck with my order, though, because I think it is more typical for these dolls to take only a few weeks to arrive. Hi:Glamm dolls were recommended to me in the comments section of one of my earlier reviews. I love getting suggestions and finding out about new dolls. In this case the "new" doll is actually five years old and discontinued, but she fits nicely into my recent fascination with MGA Entertainment, the mega-company that markets Bratz, Moxie Girlz, Moxie Teenz, Lalaloopsy, BFC Ink dolls and Novi Stars. Hi:Glamm is a series of vinyl fashion dolls released in 2007. The debut release included 5 super long-legged dolls that were also marketed by an Italian toy company called The Giochi Preziosi Group. 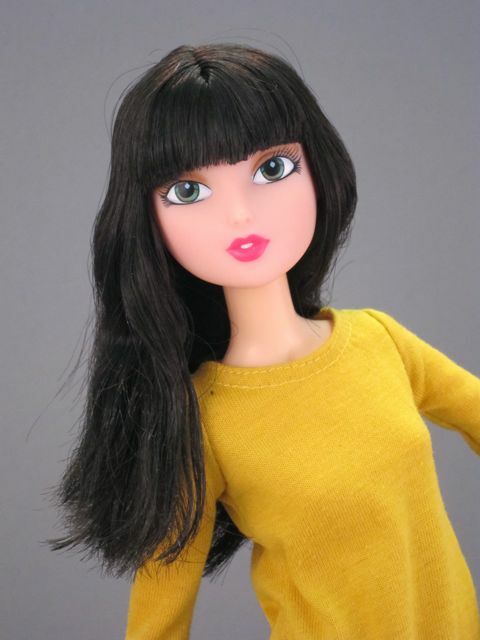 I am not positive about what (if any) differences there are between the two versions of the dolls, but this picture of an Italian Pam makes me think that perhaps the European dolls are better. 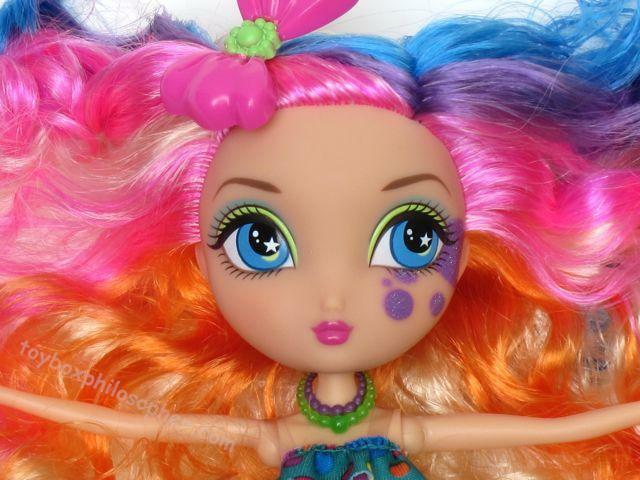 Hi:Glamm "Pam," by MGA Entertainment. Last week was tough, and so this weekend I really wanted to play. I have some great dolls in my review queue, but the toy that was calling out to me the most, promising a few hours of creative fun, was the Create-a-Monster Design Lab. The fact that I even bought this set might surprise some of you, considering how disappointed I was with my last Create-a-Monster set. The thing is, this toy was on clearance at Target (already) and seems to offer something very different from the other Create-a-Monster sets, and so I thought it was worth a look. 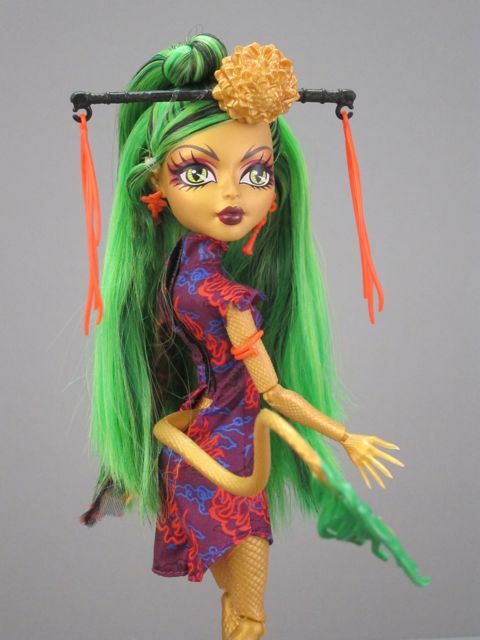 I also still have the Novi Star dolls on my mind, particularly the pictures of their heads on Monster High bodies from My Dolls Are My Models' flickr photostream. The Design Lab has a green-bodied Monster High doll and my Alie Lectric is green, so an added bonus of this set is that it gives me the perfect opportunity to see how easily a Novi Star head can fit on a different body. Creation from the Monster High Create-a-Monster Design Lab. The Novi Stars have been in stock at my local Target for a few weeks now. I spent a considerable amount of time squatting in the toy aisle and examining them when they first appeared, but I didn't feel any urge to buy one. They struck me as pretty small and simple for a $20 doll--actually my first thought was that they resemble Happy Meal toys. That's probably not a fair comparison, but the price definitely seems high. Since that first encounter, I have heard some encouraging things about the line and gotten a few requests for a review, so I decided to give these little aliens a proper investigation. The first release of Novi Stars includes five characters, each with a different special feature. Mae Tallick is a pink robot who talks, Alie Lectric is a green alien who lights up, Ari Roma is purple with big hair (she smells), Una Verse is silvery ice-blue and has glitter inside her legs and Nita Light has a white head and a transparent body and glows in the dark. I didn't see Nita Light until yesterday (at Walmart). If I had seen her sooner, she probably would have been my first pick (I love things that glow in the dark), except for the fact that she comes with a big plastic pod and is therefore more expensive than the other dolls. 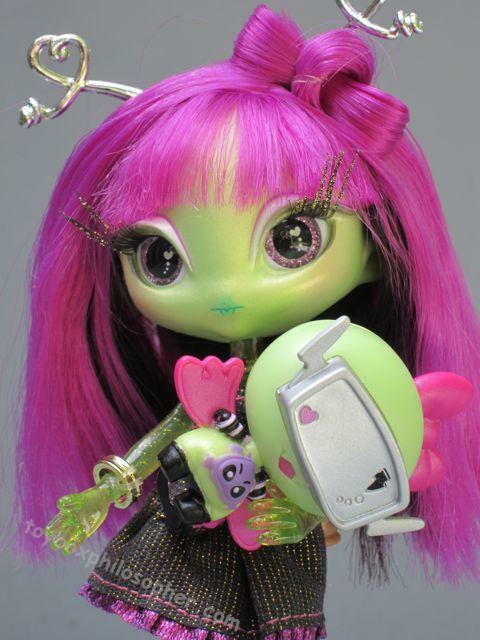 "Alie Lectric" Novi Stars doll. This was really hard (but fun!) to judge. There were so many entries that were ten times more funny and creative than anything I could come up with. My initial list of favorites had 20 names! I managed to choose six finalists--three clever captions and three great stories that capture the spirit of the blog. I'm leaving the hardest part to you, though. Please read through these entries and vote for your favorite in the poll at the side of the page. I'll keep the poll up for about a week. After the jump, I have the contest picture posted six times, with each of the finalist's captions. Just vote for the number of the caption you like best (if you can't decide, it's ok to vote for more than one caption). Good luck to all of the finalists! The 4 giveaways here are closed, but you can still enter the caption contest until tonight at 6:00pm EST. I'll do drawings for prizes and post the finalists for the caption contest tomorrow. In the meantime, a few giveaways continue over on facebook. Absolutely anyone can enter. You can enter to win as many of the toys as you want. If you enter anonymously, though, please send me an email before you comment so that I can give you a secret code name. After you get the code name, you can comment with that name and be officially entered. To start things off, see if you can come up with a caption or a story for the following picture and post it in the comments section. You have all week for this one. I'll pick some finalists at the end of the week and then we'll have a poll to vote for the winner. The winner gets all of the dolls in the picture! All dolls are used (out of their boxes) and have been reviewed. Cutie Pops "Cookie" Doll by Jada Toys, Inc. I had a few much-appreciated tips about a new doll line that has hit the shelves at some of the big chain stores. The dolls are called "Cutie Pops" and they are made by a toy company called Jada that I had honestly never heard of before. It's nice to see another competitor enter the ring with MGA Entertainment, Mattel and Spin Master. Jada Toys, Inc. is a California-based company that, since their establishment in 1999, has produced mostly die-cast cars, radio control toys and model kits. While Jada has a line of Hello Kitty toys, Cutie Pops seem to be their first foray into the doll world. At first glance, the Cutie Pops look a lot like La Dee Da dolls. They have tiny bodies and huge heads with wide, elaborate eyes. Their outfits are bursting with colors and glitter and decoration. In person, these dolls have the proportions of a Pullip doll with some traits that remind me of the Lalaloopsy line. I might have ignored them completely if it weren't for Jessica telling me that they have interchangeable eyes and hair. This was more than enough to get my attention. 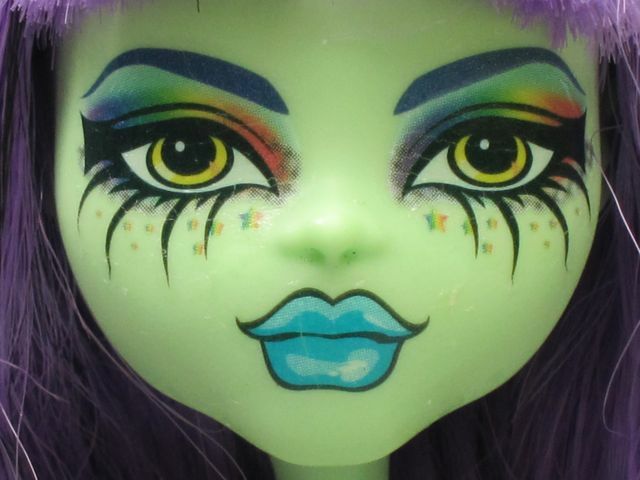 I have long thought that it would be wonderful to bring the customizing potential of Pullips and Blythes to young children. Everyone likes to be able to change a doll to suit their own personality. 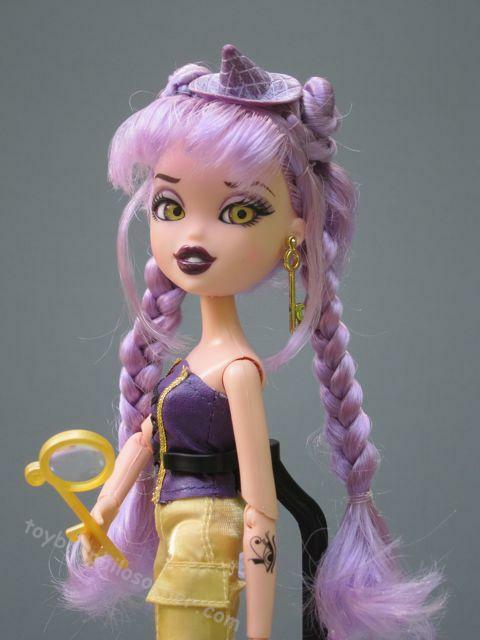 I reviewed a Bratzillaz doll pretty recently (Meygana Broomstix), but Meygana's hair was such a disaster, I decided that it might be worth looking at another one of these newcomers before passing my final judgement on the line. Also, I am experimenting with some different backgrounds for my pictures, and this doll works really well with my new favorite grey background. Let me know what you think. The other thing I want to mention before I get started is that I seem to have 99 followers. This is really exciting for me! I think that when our group gets to 100, there should be another giveaway, which is the only way I can think of to party online. I also think that at least part of the giveaway should be open to the first 100 followers only. Not to be snobby and exclusive or anything, but just as a way of saying "thank you" and celebrating you awesome first 100 followers. There will probably be a giveaway for non-followers, too, just to be fair. I'm still working on the details...and I still need one more follower (no pressure). 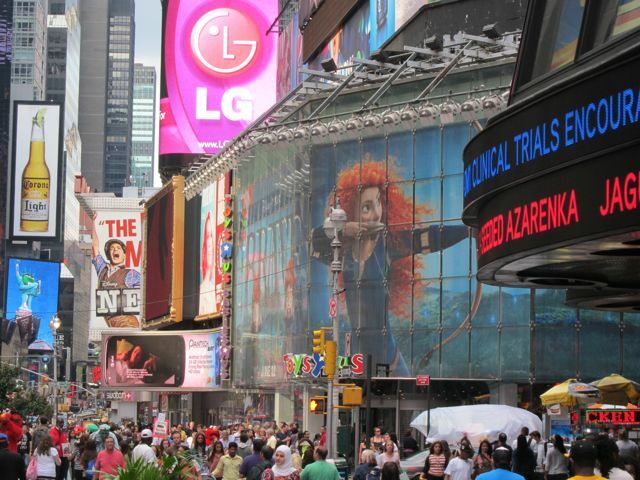 Remember back in June when I visited the Toys R Us and FAO Schwarz stores in Manhattan? The highlight of my visit to FAO Schwarz was getting to see several of the current Tonner dolls on display. 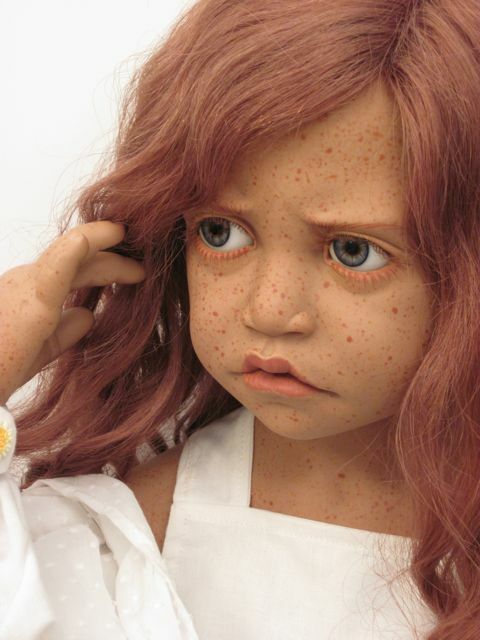 Tonner makes a huge variety of dolls, and I decided early on in my collecting years that it would be a good idea to specialize, rather than try to sample the breadth of Tonner's work. Over the years, I have collected mostly dolls with the Cinderella face mold. Lately, I have become more interested in Tonner's diversity, and this is due in part to my experience at FAO Schwarz. The dolls that impressed me at the store were not dolls that I would have given a second glance in the catalog--partly because I have gotten in the habit of skimming past them to look for Cinderella or Cami. Tonner Doll's "Beauty and Brains." This post is for Pippa and Abby, who convinced me that my Liv in Wonderland Sophie should come out of her box. You might remember from my older Liv in Wonderland post that I refused to take Sophie out of her box. This is for a strange reason--I wanted to own all of the Liv Sophie dolls (greedy) and keep them all in their boxes (strange). Call it a way to preserve the evolution of the Liv doll if you want, but I think it was just a weird collecting obsession. Anyway, this dream was crushed when Girls Getaway Sophie never made it to this country...or at least never made it to Maine, and so I couldn't get all of the Sophies. Major bummer. 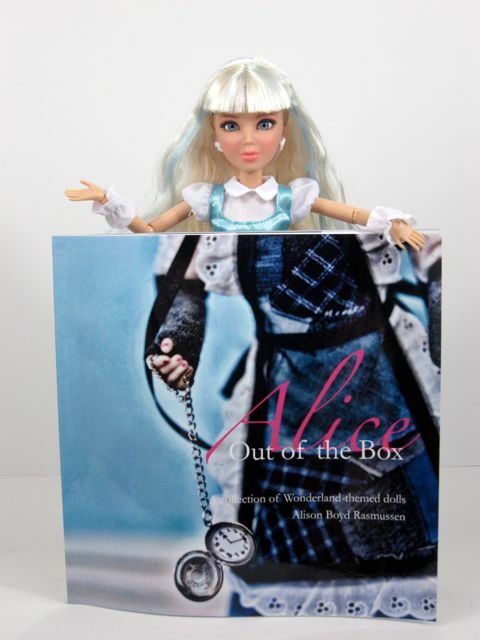 Alice out of her box with Alice Out of the Box. 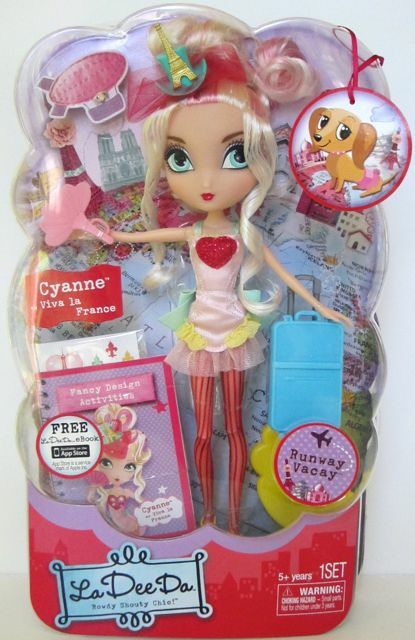 After my first La Dee Da doll review, in which I examined the "Runway Vacay" Cyanne, I got the feeling that I might have chosen the wrong doll to exemplify this new line. 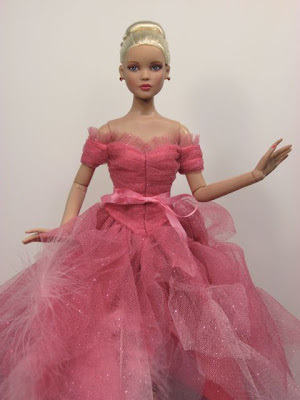 I reviewed Cyanne mostly because she was one of only two dolls available online at the time. To recap that experience, I was disappointed by Cyanne's thinly rooted hair, but learned that perhaps this is a necessity when creating up-dos with rooted curly hair. Cyanne's nondescript style was also a point of criticism. I found her tiny dress to be unimpressive, and she struck me as mundane, with a face and a theme I've seen many times before. Last, I made no secret of the fact that I was disappointed by the lack of articulation and versatility in this line. La Dee Da Sweet Party "Dots of Style Dee." I was tempted to pre-order all of the Ghouls Rule Monster High dolls from Entertainment Earth a few months ago, but the case price was overwhelming (I think it was $180...maybe more). I decided to wait and look at all of them in person and just choose my favorite. I was lucky to find all of the dolls at Toys R Us about two weeks ago. This is a fun, elaborate group of dolls and they make an excellent (and tempting) first impression. At the store, I grabbed all of them greedily into my arms and lurched towards the checkout. As I got to the front of the store, though, my head cleared and I did some quick mental math: $26.99 times four equals...ugh. Too much. I sulked back to the shelves and put them all neatly in a row and began making my agonizing decision. Well, first of all, I've been having some camera troubles lately, so it takes me ages to pull together a decent post. Sorry about that. I think I've got a solution in the works, but in the meantime, please forgive the pictures. I have been curious about Delilah Noir for several years. 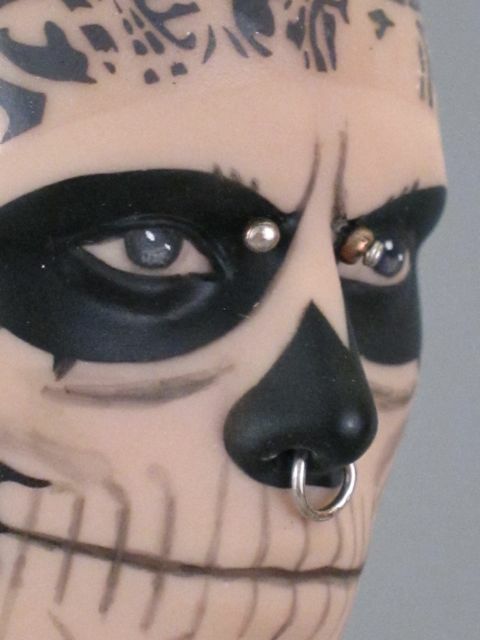 Delilah is a 16" vinyl ball jointed doll made by Ashton Drake. 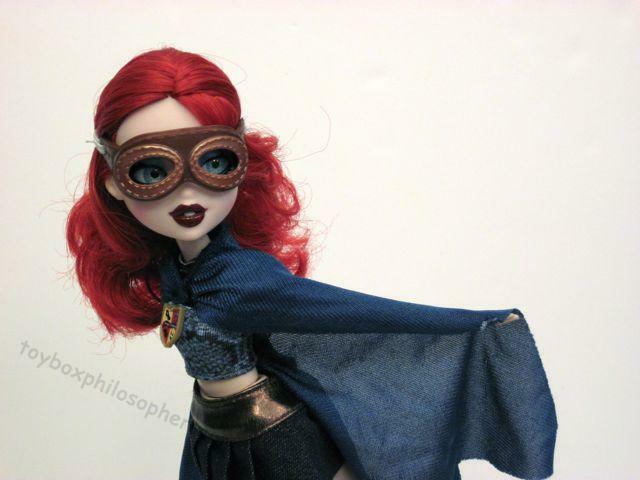 Delilah was first released in late 2009 and the debut edition earned a Doll of the Year award. 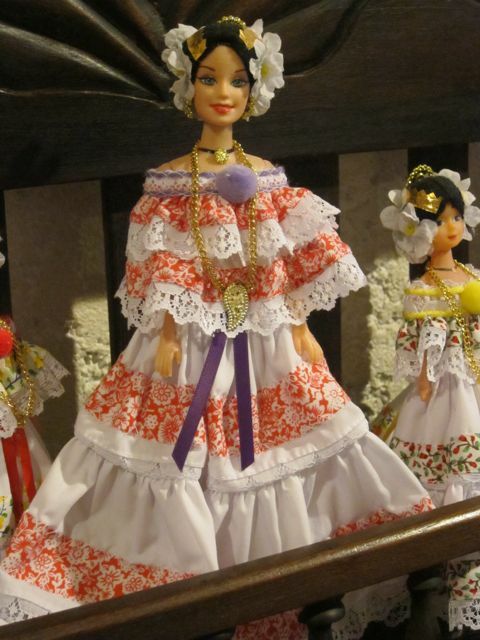 The first Delilah doll was dressed in a modest school girl outfit and wore a long blonde wig, but she also came with an extra, slightly more gothic evening ensemble and black hair. These outfits were meant to hint at the two contrasting sides to Delilah's personality, a sweet straight "A" student and a dark, edgy wild child. The subsequent doll releases have maintained this split personality to varying degrees. Despite declarations to the contrary, there were never any new characters introduced to this line, and I understand that the dolls have now been discontinued. You can still find the first Delilah doll for $150 at places like Amazon (for full price), and directly from Ashton Drake. Many of the later releases are still in stock in various doll shops...and lately they are on clearances sales of varying levels. Delilah Noir "Pretty in Pink" by Ashton Drake Galleries. Bratz dolls are not really my style. I can honestly say that I have never walked the aisles of a toy store and been tempted by a Bratz character. I don't even like the name. 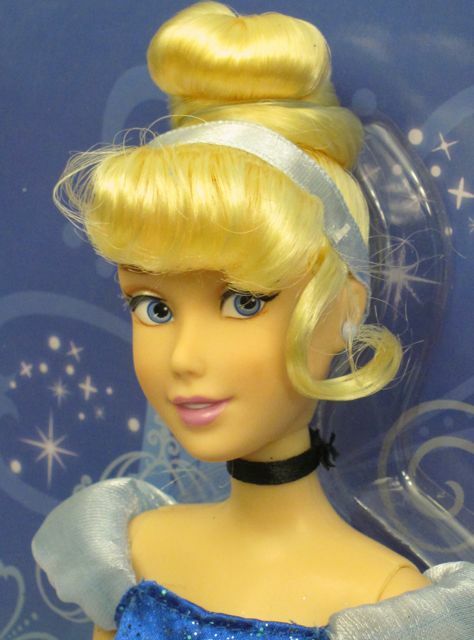 Remember that I am a huge Cinderella fan, and looking at the world through that lens, the Bratz dolls come off a bit like the bratty stepsisters. Anyway, Bratz dolls first appeared in 2001 and have been dominating an impressive chunk of the fashion doll market ever since. 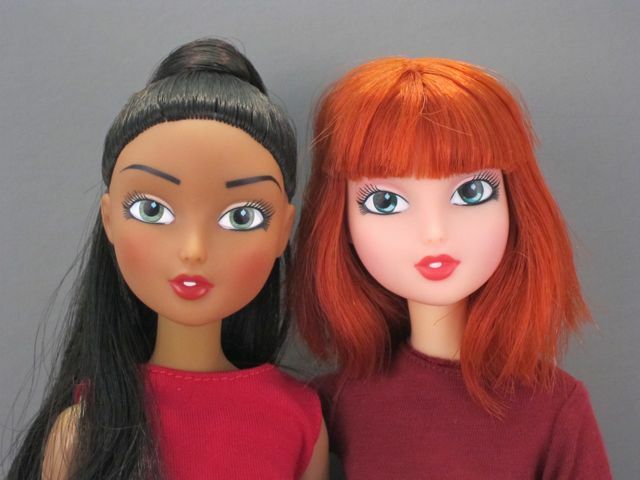 Mattel and MGA Entertainment have been suing each other back and forth over these dolls since about 2005--MGA claiming that the My Scene dolls are a rip off of Bratz and Mattel claiming that they actually own the rights to Bratz because the Bratz designer allegedly came up with the idea for these dolls while he was working for Mattel. A third party is suing Mattel and MGA for stealing what he claims is his idea. Sheesh. 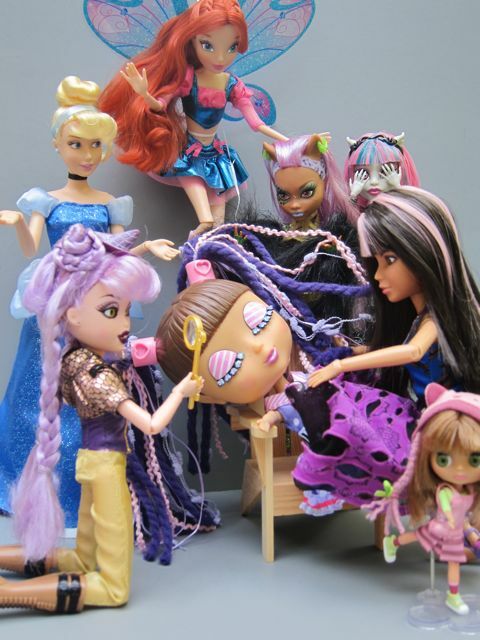 It's a big mess, and for a while there, I remember there was some serious tension among collectors about whether or not Bratz would be permanently pulled from the shelves. I was at Toys R Us the other day, as I often am, checking out the new dolls. As I was walking from the La Dee Da section back to the Monster High section, I saw a doll I'd never noticed before. I was immediately drawn to her sweet face, her highly articulated body and her bright red hair. These are three things I love to see in a doll. So, I was standing there in the aisle inspecting this cute new doll when a whole group of Toys R Us employees bustled past with determination--clearly on a mission. One of them stopped, halting the whole group behind him, looked at me and shouted, "There! She has the last one!" I went all deer-in-the-headlights and pointed to myself questioningly, wondering if I should put the doll down and run. Most of the employees looked at me, looked at the doll, and then slouched defeatedly back to the cash registers. One kind soul stayed behind to explain that I was holding the last Winx Club doll in the store, that none of the stores in the area have any left, and that "some lady" keeps calling and asking them to search the store and put all available dolls on hold for her. He earnestly recommended that I not put the doll down lest someone grab it away from me. Seriously? I clutched the box closer to my chest and said, "oh, really? So...these are, uh, popular with the kids?" He smiled at me and shook his head, "you have no idea. I guess there's a show or something." I wasn't as thorough as I should have been with my Disney Store Rapunzel review yesterday, or with my 12" Merida review, for that matter. Fortunately, I had time this morning to de-box Cinderella, and she made some of the flaws and potential problems with the new articulation pretty glaringly obvious. The newest version of Rapunzel and her predecessor. I'm taking over the internet! Today it's eBay, tomorrow--the world! Bwahahaha! Seriously, though, I have my eBay page up and running. My call sign is "toyboxphilosopher." There's a button on the right hand side of the blog which is a bit annoying, but it should take you to my auctions any time you want. My plan is to start all auctions at $1 with actual shipping. I'll probably need to tweak things and try different selling methods (Buy it Now? Longer auctions? ), but I'm hoping this can be a way to clear out reviewed or extra dolls at fair prices. Please feel free to offer advice or suggestions in the comments. I am not a very experienced eBay seller. I never thought I would own this doll. I watched with interest when she was released at the Tonner Doll Company's Flights of Fancy convention back in May, but knew I couldn't swing the $350 price tag (which, of course, translated into $500 on eBay). I was drawn to her not because she depicts Marilyn Monroe, but just because she is a rare type of release for Tonner--a 22" inch doll with a new face. And it's a beautiful face. On the discussion boards, this doll was met with a ton of criticism for not looking enough like Marilyn Monroe--specifically for not having Marilyn's voluptuous curves. I am not a Marilyn expert, nor am I interested in finding the perfect Marilyn clone, so I'm a pretty easy audience. I picture the real Marilyn as having had a tiny waist and a large chest, and this doll fits that image just fine. She might be a bit too tall and long-legged, but that's about the only critique I can muster. Despite the online discontent, collectors who saw this doll in person at the convention seemed to think she was lovely--some even used the word "stunning," and this made an impression on me. Furthermore, I was downright haunted by her unique face. I kept gazing at pictures of her online, wondering what she might look like in person, waiting to see if her price would drop. She struck me as something special. You might remember how excited I've been to see the Pixar movie, Brave. My excitement stemmed mostly from my enthusiasm for Disney's last masterpiece, Tangled. I haven't enjoyed a Disney movie that much since I was a kid. 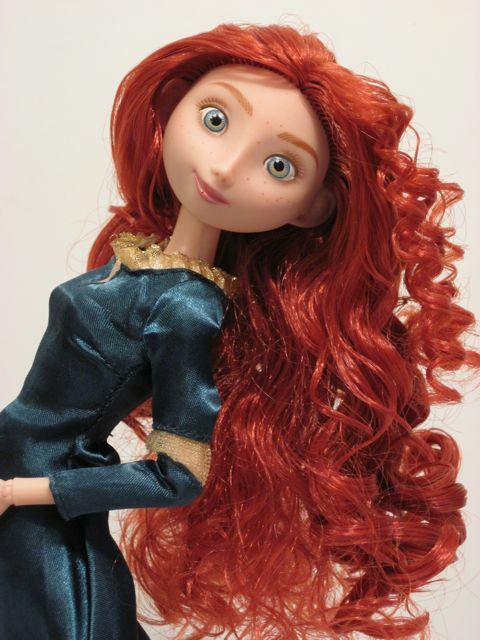 I had high hopes for Brave, and for the the Disney Store doll line that would inevitably accompany it. The Brave dolls have actually been out for way longer than the movie, which just opened last week. Not only are the Disney Store shelves packed with Brave dolls right now (including the limited edition 18" Merida), but brand new versions of all of the other princess are available for $14.50 (or 2 for $22 with the current sale). 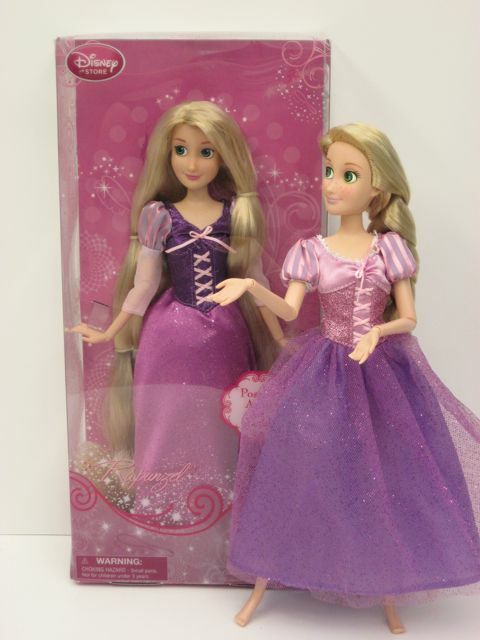 These new dolls are worth a look because they have different articulation and, it looks like at least Rapunzel has a new face mold. I'll have to check that out. 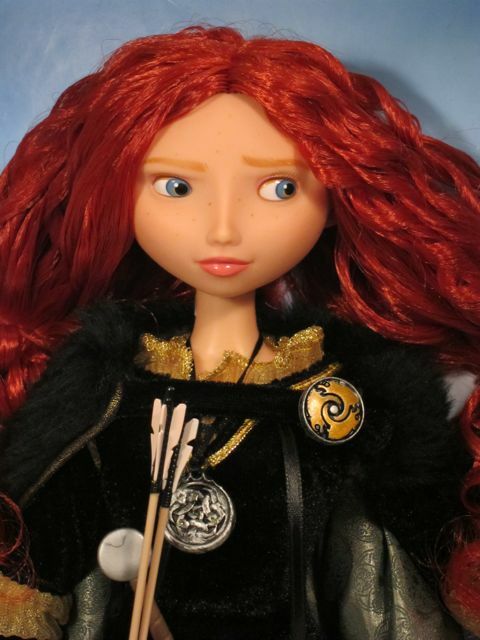 Classic 12" Brave Merida from the Disney Store. Many of you voted on which Monster High Roller Maze doll I should de-box next, and Lagoona won with a whopping 48% of the votes! I'm so glad you picked her because she is my favorite Monster High character. Ghoulia was the second most popular pick with 18% of the vote, and poor Frankie came in last--but just by a hair (16% of you wanted me to open her). Well, I got my hands on a few of the newest dolls from Spin Master. These girls have been causing a stir since they were displayed at the Toy Fair in New York last February. 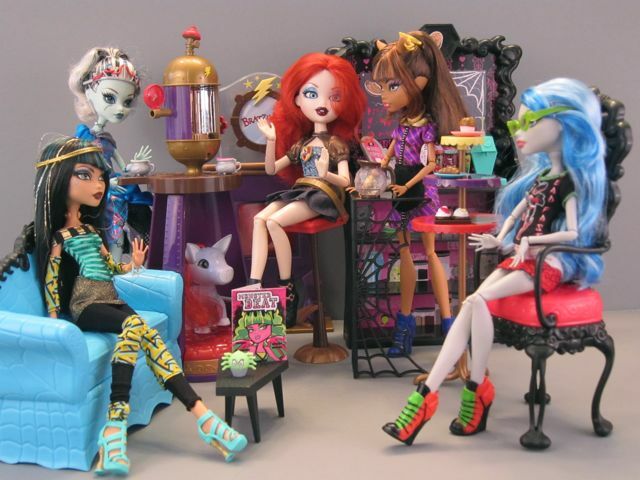 They are called "La Dee Da" dolls, named after Dee, who is the fashion-forward leader of the pack. The name of the line confuses me, though, because although it's catchy, don't people usually say, "well, la dee da" when they're being mocking and dismissive? Sometimes even "la dee frickin' da?" Are these dolls dissing me from inside the box? Presumably not. Perhaps it's just meant to be an upbeat, sing-songy name in keeping with the cheery appearance of the dolls. Spin Master has a knack for manufacturing trendy products. Bakugan toys, Tech Deck mini skate boards, the adorable Zoobles--these have all been highly sought after and impossible to find at times. Spin Master is also, of course, the company that introduced us to the innovative and highly articulated Liv dolls in 2009, and then recently announced the discontinuation of that beloved line. Given the company's track record, I feel pretty sure that the La Dee Da dolls will be trendy, at least for a little while. La Dee Da "Runway Vacay Cyanne." 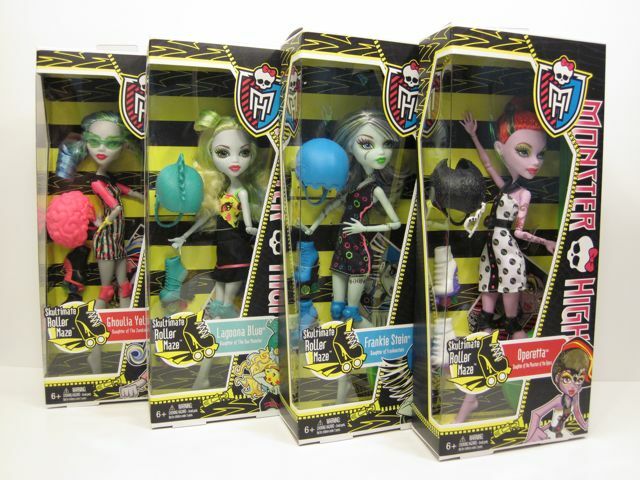 Monster High Skultimate Roller Maze Dolls Arrive! Monster High Skultimate Roller Maze from left: Ghoulia, Lagoona, Frankie and Operetta. 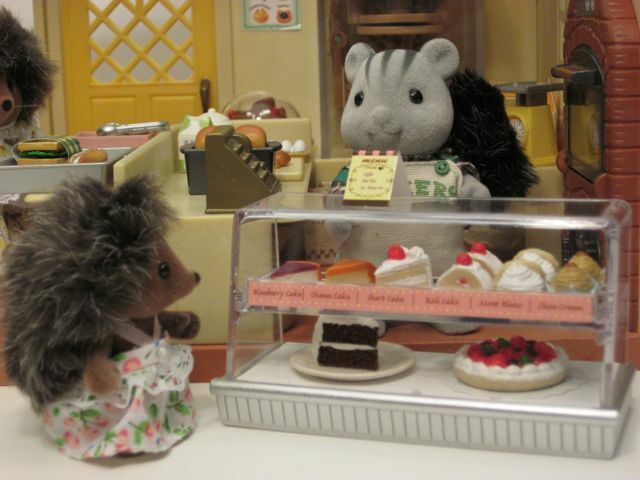 The Sylvanian Families Water Mill Bakery--a Quick Look. Sylvanian Families "Water Mill Bakery." 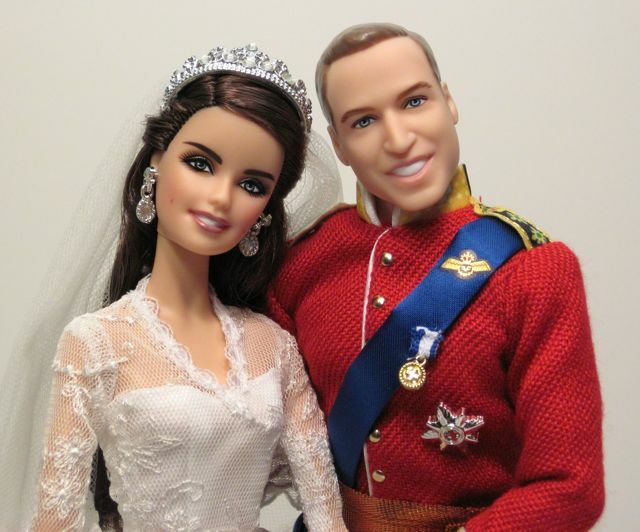 The only dolls that followed me home from Manhattan last weekend are the William and Catherine Barbie dolls that I found at the massive Toys R Us in Times Square. I had seen this set in pictures online and been slightly interested, but never interested enough to shell out the currency necessary to buy them. I don't know if it was seeing them in person that won me over, or that I was caught up in the excitement of the big city, but they seemed like the perfect set to buy at the time--certainly the most special of the numerous Barbie sets that were on display. The problem with getting caught up in a moment is that you loose track of things like the little fact that while I paid $127, this set actually only costs $109 if you buy it online...and I mean if you buy it online at Toys R Us. So I paid a premium for the experience of buying it at the flagship store, but I guess I am okay with that. It's a really fun store. Incidentally, the other Barbie set that kept catching my eye on this trip was the Pillow Talk set with Rock Hudson and Doris Day. You can get these dolls on Amazon for 40 bucks right now. If I could remember anything about that movie, I would definitely have purchased this set. I can only remember Doris Day from the Hitchcock movie, The Man Who Knew Too Much. Anyway--the dolls look great in real life. I am back from a short trip to Manhattan and I'd love to share a few pictures with you while I get unpacked and organized for the next review. My mom lives in New York City and so we visit every now and then--although nowhere near as often as I wish we did. When my kids were little, trips to FAO Schwarz and the massive Toys R Us in Times Square were nice rest stops in between more educational outings. Now that they are older, my boys are more interested in the Apple Store and the jazz scene, but I am still drawn to these two behemoths of toy retail. A Review of Hayden's House...as the Last of the Liv Dolls Leave the Shelves. 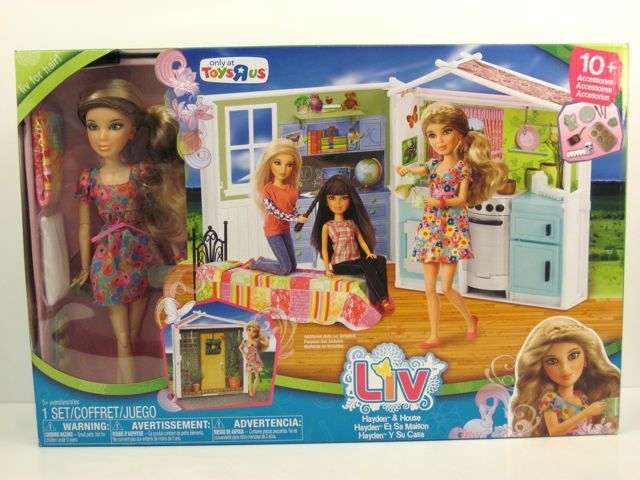 For a few months now, there have been whispers that Spin Master is shutting down production of the Liv doll. A friend on Flickr warned me about this a while ago, and it was confirmed on Dana's blog last week. Now, even Wikipedia reports the sad news (although I read Wikipedia with a skeptical eye). This decision is surely based on low profits, so my question is--why weren't Liv dolls more successful? Well, I want to hear your thoughts on this, but here are mine for starters. First of all, the beauty of Liv dolls is that they are highly customizable. In theory, you could buy just one Liv doll and then change her wig and outfit every day for endless new looks. At most, it seems like you might want one of each character, and then you could focus your spending on accessories and new wigs. Two problems with this from a marketing standpoint--first, people don't feel the need to buy very many dolls, which is good for buyers but bad for business. Second, Spin Master didn't make enough outfits, wigs and accessories for these smaller items to carry people's enthusiasm or turn a profit on their own. My second thought is related to the first. The earlier waves of Liv dolls were all very similar. Except for different outfits and wigs (and some small changes in face shape and eye color) the dolls were almost identical. This contributed to consumers feeling that they didn't need every single doll that came out. In addition, I can imagine some resentment in people who felt like they had to buy a whole new duplicate doll just to get a cute outfit or wig. Spin Master seems to have tried to remedy the sameness in their dolls by making some drastic changes to the most recent doll's bodies. In my opinion, these changes were a big mistake. The Twist and Dance dolls' gimmicky bodies are virtually impossible to play with, and the Liv for Color and Brites dolls, while not awful, have definitely lost the Liv magic. My last hypothesis is much simpler--Monster High dolls came out right after Liv and these creative and seemingly rare creatures stole everyone's attention and allowance. From what I have heard, Tonner Doll conventions are extremely fun. I have never been to one, but when there's a convention going on, I follow the excitement through Tonner's high-coverage blog, the Prego message board and Terri's blog. Photographs from these events always include lots of big smiles, lots of people in elaborate costumes, lots of creative decorations and centerpieces...and of course tons of gorgeous dolls. This year the convention was in Chicago and the title was "Tonner Air." Dolls from the event had an aerial theme, including airline staff characters and dolls dressed as different colorful birds. How fun does that sound? My primary objective when I am watching a Tonner convention from afar is to scope out any Cinderella-faced dolls. Because, you know, I am a bit obsessed with this face. Some of the most beautiful Tonner Cinderellas and Camis have come from conventions; Christine Daae, Lady G, Blue Fairy, Delight, Fare Game, Party All Night and Silver Splendor to name a few. While I adore Cami, my heart belongs to Cinderella, and so I like it when Tonner revives this sweeter, less modern version of the face mold, as he did with Nu Mood Jess. 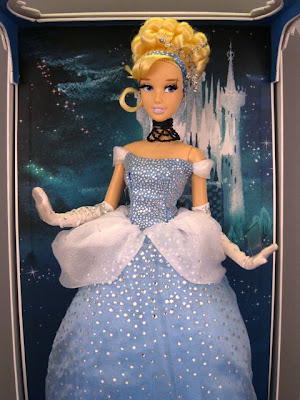 I also prefer that my Cinderella dolls be in ball gowns, rather than the more modern wardrobe of the Cami line. So, considering all of that, you can picture my glee when I saw this year's convention Cinderella-faced doll, "Flamingo:"
Tonner convention "Flamingo," LE 300. 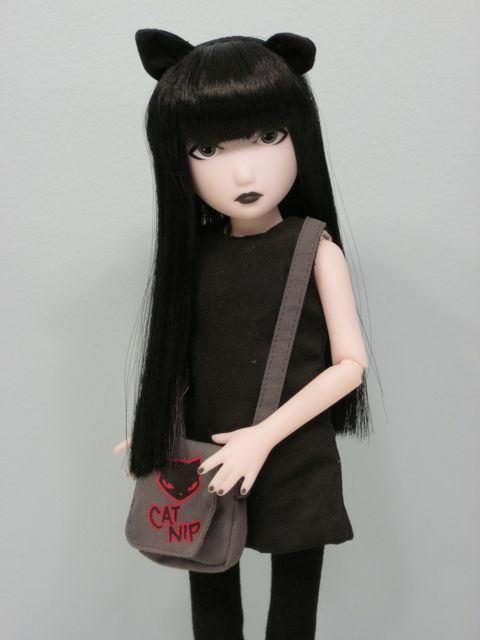 Nicki asked to see my Emily the Strange doll, and I happen to have a few pictures of her, so here we go. I think Emily provides an interesting contrast to my Little Apple Doll, Erro. Both are white vinyl dolls with black features and black hair, and both have a gothic edge to them. The difference is that while Erro's character is caught in between the living and the dead (and is therefore a bit creepy), Emily is fully alive and just...strange. I have liked Emily the Strange since her emergence in 1990. I remember that when she first appeared, it wasn't clear who she was. She was just this girl who wore black and liked cats and lurked on tee shirts. I used to buy Emily the Strange tee shirts because, you know, she and I share a name (and the tee shirts are pretty awesome). Nowadays, you can buy a ton of Emily the Strange merchandise, including books, stickers, comics, clothing and dolls. I think there's even going to be a movie. But this isn't a full review, I just want to show you the doll really quick, if I can manage that. 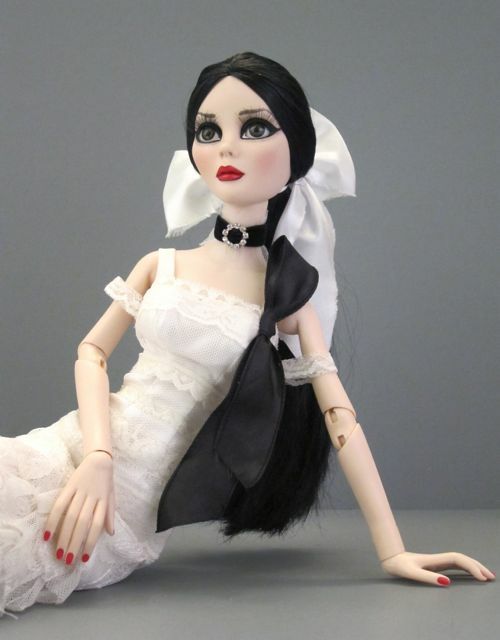 Ashton Drake made their 12" vinyl Emily the Strange doll in 2010. She retails for $60, which is too high, but I decided to buy her anyway. She is still readily available.